I’d really like you to keep a Journal for your next 100 Day Goal. It’s a simple little thing to do and it’ll whiz you towards your 100 Day Goal with no extra effort. It can be hard to work out what Microactions to do! But keeping a journal can help with both of these! 1.It keeps you accountable. When you know you need to write down what you did, you make sure you do it! Really. You’ll want to have things to write down! 2.It works like a ‘Don’t’ Break The Chain’. Once you’ve kept your 100 Day Goal Journal for a few days you won’t want to ‘break the chain’ of having written in it. Empty pages in your journal will stick out like a sore thumb. 3.It kick starts the Halo effect. Every time you write down your ‘wins’ (your progress towards your goal) your brain sends a dose of the success hormone Dopamine around your body. Dopamine feels good, so our bodies want more of it, and, in a nutshell, that’s why we feel a surge of energy and desire to work harder (called the Halo effect) when we record a success! 4.You won’t want to waste it. If you invest in a nice journal you won’t want to waste it by only writing in it a couple of days, and this simple little thought will keep you doing Microactions. I know: sometimes the secret to keeping-on-going is as simple as that! How the 100 Day Journal helps you find good Microactions to do! Now this is the more sciency bit, so stick with me for a minute. Our subconscious brain is the most powerful, yet most under-used tool, we have available to crack our 100 Day Goal. When we give it the right information, our subconscious spots opportunities that our conscious brain misses, see patterns that we don’t notice and synthesises a ton of data to come up with amazing ideas for us! Kinda like our very own internal computer. But our subconscious brain doesn’t do any of this, unless we TUNE IT IN! Our subconscious is a very busy beast! It gets bombarded with over 11million bits of info a second. It’s drowning in data. So rather than try and process it all, it doesn’t bother. Instead it has a very effective filter system (the Reticular Activation System*) and it rejects any info that it doesn’t consider useful. The majority of the info your subconscious receives never makes it inside! So we want our subconscious brain to help us with our 100 Day Goal (and come up with good ideas for us) but we need to let it know that our 100 Day Goal is important. By telling our subconscious our goal simply and often! 2.When we complete our Journal at night it reminds our subconscious to work on our goal while we sleep. Our brain uses sleep cycles to work through problems, it’s called Dream Learning, and it’s a THING! Our brains solve problems and come up with the best ideas while we sleep. 3.When we re-read earlier entries in our Journal it gives our subconscious more data to work on – and that in turn helps our subconscious come up with better ideas for us. 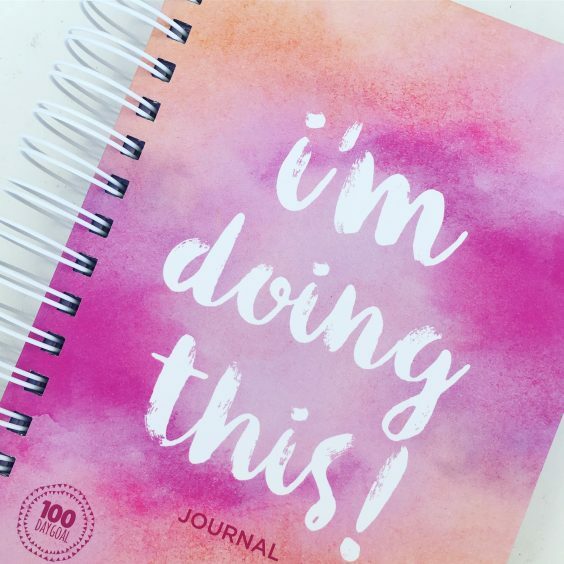 I’ve got Hard Copy 100 Day Goal Journals printed specifically for the 100 Day Goal so the layout is all there, you just have to fill it in (plus it’s got a goal tracker, don’t break the chain, 10 day sprints, reflections, quotes and is just GORGEOUS). And I got them made because I couldn’t find anything else which did the job! But do feel free to make your own Journal if you fancy! I’d love you to have a cracking 100 Day Goal, so keep a 100 Day Goal Journal. It’s the two minutes a day task that pays you back by the bucketload! 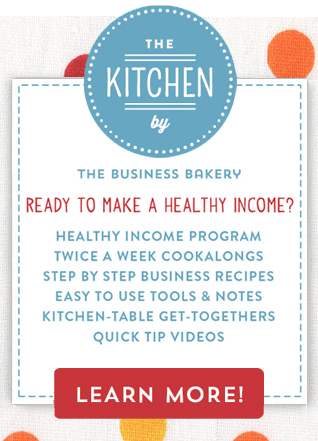 Kitchen-Tables and Business Buddies How to achieve more using ONE long list and ONE good question! Good Things Jar Ten ways to get the most out of a short work day!